Roger Ehrenberg, ex-banker turned startup investor, wrote a good post a while back discussing the possibility that the collapse of wall street will fan the entrepreneurial flames of ex-wall streeters. I’ve been talking about this since the beginning of the financial crisis and I have an answer: YES. 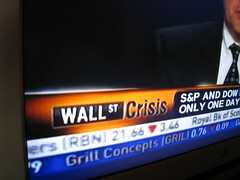 I believe that the financial crisis will lead to positive changes in the lives of many Americans. As an ex-banker (well, sort of, equity research) turned sailor turned startup grunt turned rock band bassist turned student of startups, I believe that unleashing a herd of hardworking and (relatively) intelligent people will lead to more than a few entrepreneurial success stories. If nothing else, a forced break from the fire-hose of “absolutely critical” business and career will help people to understand that there is more to life than climbing the corporate ladder. Shouldn’t it worry you that spending a sunny weekday on sheep’s meadow nearly drives you crazy? Thoughts on what I call “the river” and “PDA dependency” to come on later posts. When The Street began to fall apart, I dreamed up a new project: collecting a set of stories about Ex-Wall Streeters who, freed from jobs that they hated, go on to pursue their passions and, most likely, much happier lives. What do you think? I’m not saying that every banker is self-loathing (most of the truly successful ones aren’t), but a lot are. Sadly, people stay in jobs that they hate because their “opportunity cost” is too high to leave. They’d rather pay the price of lifelong self-resentment than pursue fulfillment in, gasp, a potentially less lucrative field. Why do people who manage risk for their living make such “irrational” decisions you may ask? Their myopia is the result of spending 7 days a week, 51 weeks a year (save a week long “recharge” in an otherwise unused cottage in the Hamptons) in a culture that has but one yardstick, the dollar. The simplicity of a system where every decision can be measured with one simple metric- how much $$$ am I making? – is both distorting and intoxicating. To bring it home, I believe that Roger’s third factor, risk, will have the most affect on the ex-Wall Streeters. Wall Street was never risky to its participants. It’s probably one of the safest career choices (on an expected value basis) available. No longer be able to tell exhilarating stories about the exorbitant sums they made with Other People’s Money, these people will have to completely re-conceive their personal notion of risk and how it interfaces with their self-image. Drawing spreadsheets for a modest living is a bit harder to sell as exciting and risk taking, even to oneself. Accountants, where you at? I think, and sincerely hope, that the implosion of “gravy train” will liberate talented ex-Wall Streeters from their myopic fear and enable them to follow their dreams. Value expansion, if only in the personal sense, seems inevitable. If anyone wants to tell their story or has a friend that wants rap about their new plans, I’d love to talk to you. Thanks and good luck.